23 NYCRR 500 is one of the strictest cyber security regulations at a federal or state level. Under NYCRR, New York insurance companies, banks, and other regulated financial services institutions must implement and enforce granular limitations on access privileges for systems and data. 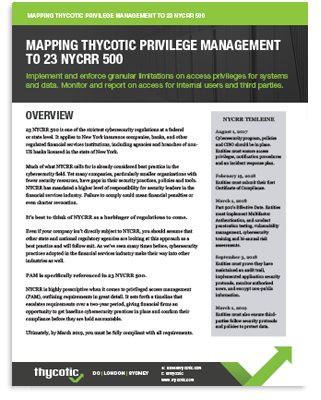 NYCRR is highly prescriptive when it comes to privileged access management (PAM), outlining requirements in great detail. It sets forth a timeline of escalating requirements, giving financial firms an opportunity to get baseline cybersecurity practices in place and confirm their compliance before they are held accountable. Make sure you are fully compliant with NYCRR by the March 2019 deadline. Get our guide to NYCRR to see how your privilege management practices map to compliance requirements.